So you know how you aren’t supposed to leave things until the last minute? I’m bad at that rule. I picked this source a few months ago, I even picked the page – https://gallica.bnf.fr/ark:/12148/btv1b8530222d/f225.item Something about it just called to me and said, do this one for Katla, even though it’s not Norse, I think she’ll like it. I printed out a few pages and tucked them into my practice notebook since I haven’t done calligraphy in many months, figuring I’d need all the practice I could get. Then I failed to act on this pre-planning. Fast forward to the weekend before it was due, I still hadn’t started and I didn’t have words. So I started emailing my wordsmith friends and they were busy, so I brainstormed and plotted and eventually gave up and asked Matthias Grunwold if he’d be up for it, thankfully he was. Monday night I tried to work on it but just couldn’t concentrate. Tuesday I got the layout done and penciled in all the lines. I even got a little of the painting done. Wednesday night my brain was fried, so I said no. Thursday was no better, but I got the colors blocked in. Friday I had friends coming over for dinner so I had to clean the house and cook. But after they left, I sat down and did the calligraphy with basically zero practice. It came out pretty good, I’m glad that muscle memory is a thing. Most of the errors were from me being tired. So this picture is when I called it quits at midnight on Friday, having attempted to start outlining and realizing that was a bad plan. So I got up nice and early and went to start working on the illumination. I put my hand down on the calligraphy to steady my hand and smudged the ink that had been drying for the last 7 hours! Panic sets in, I consider scraping the whole thing, I come up with contingency plans, I text friends, I generally freaked out about this mess I made. I then carefully continued to work on the outlines, adding the details that make it look good, it started to take shape and the pounce fell away as it dried the ink below. Maybe all was not entirely lost – this picture is from 9:06 am, you can better see the smudge damage here since the pounce is mostly gone now. All erased, time to try to scrape off the offending ink! Post scalpel scraping. Nearly all traces of the earlier mess are gone! So I printed off the cut sheet, packaged it up with a backing board, mat and archival bag and took one last picture before jumping in the shower to get ready to leave, I managed to only leave an hour later than planned, which considering my morning, I decided was doing quite well. So one of the fun things about non-writ peerages is that you never know what the recipient is going to wear, I mean, yes, you go to their house and steal their clothes and bring it to NY.. but sometimes they do silly things like keeping wool garb in a ceder chest (after it had been attacked by moths in the past, so totally a good idea). But regardless, we couldn’t find the viking dress we had planned to bring for Thyra to have the option to wear. But one of the great things about non-writ peerages is interpreting their in case of peer letters. One of the things that Thyra asked for was viking styled award regalia, namely a viking swag. Naomi and Leanne asked me to make a medallion for that and then it morphed into me organizing the project, which was a great deal of fun. Firstly I needed beads. This is not in my skill set, and really probably should never be in my skill set, but that’s where these projects become fun projects – Collaboration time! It just happened to work out that Birka was the weekend before the event, so I had a great opportunity to meet up with some of the most talented glass lampwork bead makers in the East. I contacted them ahead of time and explained the project and everyone was excited to participate and bring beads to Birka. I asked her for suggestions for who else to ask and she suggested I talk to Mistress Elizabeth Elenore Lovell, Mistress Tola knitýr and of course Mistress Iulia Agricola. Meanwhile back at the ranch, I was busily designing a medallion to hang off the swag. We knew we wanted a rose inside laurel leaves, but the style and ratios were up to me. I grabbed my handy dandy rose template from the Pennsic Traceable Art project. (which ack, the hosting is going away, someone save this site!) and then went on to the dreaded pinterest.com and searched for laurel wreaths. After being wholly overwhelmed by the variety I picked a simple one since I was going to be carving this into wax. I then went looking for my kit of wax carving tools and wax. Into the basement! Oh god the basement. Oh look, all these reminders of art projects I’d love to work on if I only had more time to spend on them, but everything is so disorganized and stressful and aaaaaaaaaaa. I couldn’t find the wax. So I ordered more wax. Wax showed up. I found my knives and started working on trying to carve the wax. My knives weren’t really working well on it, and then I found my wax carving tools and things started to go better. But I was running out of time and lost wax casting has one big problem with it – if it doesn’t go well, you have to start over. I figured out a good work around for this, making a silicone mold of the wax mold so you can make another wax to work with to make the mold, but I really didn’t have the time or energy to do this this time around. So I went back to what I know, soapstone molds. Except that the soapstone we had in the house was full of inclusions and grit and was awful to work with. After an hour and a half of just trying to carve out the round shape for the medallion, I said no. I am not doing this. I packed up my stuff and headed to Master Rozi’s in the morning. When I got to Rozi’s she asked how things were going and where I was with the project and I explained and said I was totally open for any suggestions she might have as I was rapidly running out of cope. We could engrave, we could etch, we could carve a wooden mold, we could do any number of techniques. I had all my tools and materials with me so there were lots of options. We then took this tag and put it in a vise and folded the tongue around a nail. Rozi laughed at how much easier this was with two people and I said, yeah, you have these apprentices that you could put to work helping with things like this :). I transferred the design to the copper using a sharpie and free handing the design. The center line is there to keep things lined up. And here’s where the work gets fun and I forget to take pictures.. Someday I’ll be better about this, but probably not until I set up a rig to auto-take the progress pictures. I started to enscribe the lines with the tools I had with me, and improvised tools that we made from things around the shop until I remembered that David has a ton of metal stamping tools for leather working. He had had other plans for the weekend but came over with his tools in quick order to help. He also brought his chasing and repousse tools that he bought from the Livonia Smithery at Pennsic. I had been contemplating learning this skill set but hadn’t gotten around to it and so I excitedly picked up the tools and went to work, figuring it out as I went along. It just clicked and I went forth and made this awesome thing. This picture is awful (mostly lighting, but also it’s just a crop from the larger picture. I may send Dave over to Thyra’s house to get a better picture some day) but it shows the final item. The lines were all tapped into place and then I used various punches and random objects to dish out the shapes. I then put in some texturing using the leather punches. I would definitely do this again, I had a great time with this art form and reading up on it and watching youtube videos fills me with glee and ideas. It looks like there were also a lot of things I could have done to make it easier to work (primarily having something that holds it in place and allows the metal to move properly.) But I have the basic technique down, so it’s all tuning from this point out. I definitely want to make more copper pendents like this for various awards since it’s so pretty and also great for early period personas. Plus it was pretty easy and fun to make the pendent. But I was not done yet.. there was still the putting the whole thing together part of the project. So Thursday before the event I went over to Leanne’s to help her with the vigil food and to string the beads. She added a sheep to the horde and there were a few other copper items that I had gotten from Ygraine at birka to add to the swag. I couldn’t find heavy weight thread and was concerned about it getting tangled while being presented in court if they were going to put it on her, so I initially strung it on wire, which was sometimes done in period. I thought that stringing would be a quick and easy thing to do.. Ha. yeah I was wrong. I think I put it together about 15 different ways before I found one that made me happy, and had everything dangling how I wanted it. Then I made handpies and hedgehogs for the vigil. Friday before the event I realized I needed something to connect the swags and attach it to the brooches during court. I started with some pretty aluminum wire that was coated to look like copper but it was way too soft and bent out of shape very easily. I needed real copper wire. I contemplated driving over to Home Depot but Dave stopped me and reminded me that we had extra romex in the basement. He went down and rescued it for me and I twisted it up into the swirlies that I wanted to make. They aren’t great looking, but they were a last minute solution to a problem that I hadn’t even thought of when I started the project. I hope to make some more in the future, this time planned ahead. Here’s the finished swag. It came out very well all things considered, and it very much captures Thyra’s serious and silly nature. I hope to make more things in this vein. I’ve been wanting to explore these metal work techniques for years and this was a good push to make me get my tools out. So I had a quick turn around assignment (9 full days) for a viking who makes mead for his area and is a well respected artisan. I contemplated making him a paper scroll that looked like a rune stone, but decided in the time available I couldn’t do that justice. So I started contemplating a real runestone, perhaps made of a plaque of wood. Then I went to Panteria. First thing Saturday morning I went wandering around the merchants just to see who was selling what. I came across a group selling all sorts of cups and feast gear named Plunder Sisters. There I found a simple turned cup that looked like it was newly made out of perhaps pine. 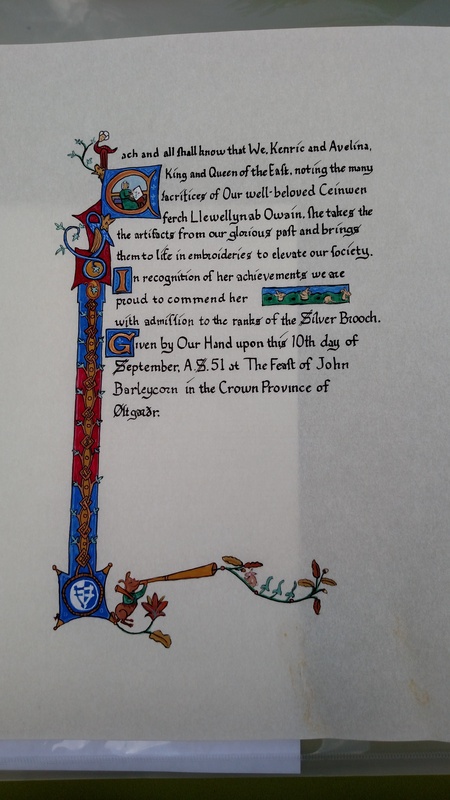 The grain was nice and the workmanship good and it was about the right size for the scroll. I purchased the cup and put it in my bag. Now to design the scroll! My fellow scribal buddies and I sat around in the dark discussing words and design ideas. Ring givers, mead maker.. gods, mead, mead of poetry… there may have been some mead drinking involved too. The next morning I went back to the merchant to get the details of the maker and it turns out the maker is a guy named Alistair and it was his first event, and first sale! Perfect. I took the central image from here and wrote out text that is based on the runestone inscriptions that have been found in similar locations. They are nearly always short and to the point. My wordsmith, Aesa feilinn Jossursdottir based the words on the Risbyle Runestones found near the western shore of Lake Vallentunasjön in Uppland, Sweden, dating from the Viking Age. I then asked Ávaldr Valbjarnarson to translate this into runes. I had initially planned to paint the cup, but then I wasn’t sure if the paint and tung oil finish would play nice together, so since I didn’t have a lot of time to experiment (we’re at 2 full days now) I decided it was safest to inscribe using my hand chisels. I rubbed it with two coats of tung oil finish and rushed it off the courier who was going down to the event, with about an hour to spare! If anyone knows how to get in touch with Alistair from Plunder Sisters, I’d love to send him a link to this so he can see how it turned out. I finally figured out how to link my portfolio to the main page of the blog, so now it’s up in the title bar, hopefully that will be obvious enough for anyone looking for it. I’ve been trying very hard to try something new each time I have a new assignment, which is great and keeps me excited, however it makes it difficult to get progressively better at one thing. So my current plan is to work from a single time period/location for a awhile, see if I can make noticeable progress in a particular segment of the scribal field. I chose to focus on two particular manuscripts – This Bible on Gallica from 1150-1200 for the script and this Untitled document from Gallica 1175-1200 mainly for the illumination. I chose to go with these two rather than one or the other because I really like the script in the first one, but it has very limited illumination. 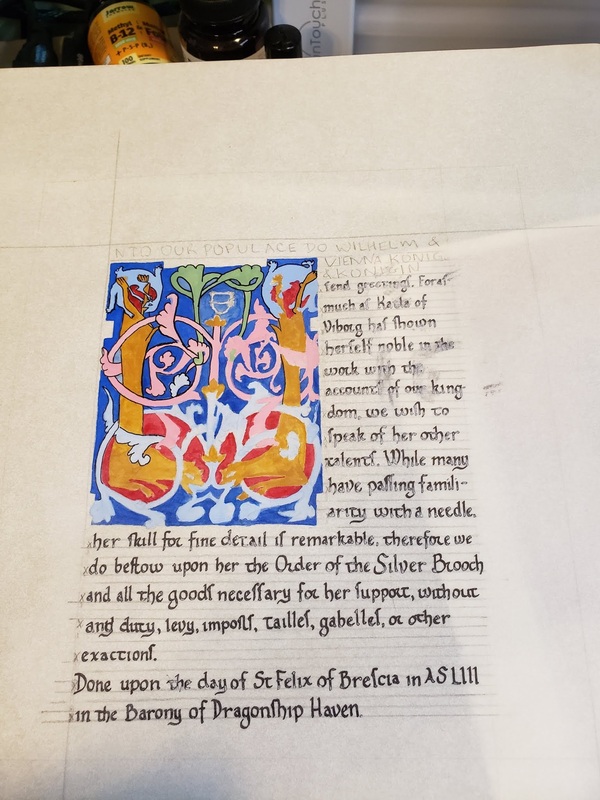 The script in the second document is similar to the first but is a bit more gothic than I wanted to work with for this project – however it has amazing illuminations in designs that would work rather well for SCA scrolls. As they appear to be pretty closely related to each other in time and place, I feel it’s ok to mix them together. My daily scribal practice is entirely based on this Bible. I’ve copied out the first page and zoomed in and have very close images of the hand as it was written in context. From this I am developing a ductus for this exact hand. To help with my particular issues doing scrolls, I’m copying text from a Latin text and writing it in my practice journal. This has two major benefits – I get better at copying things I don’t know how to read and by using latin, it’s easier to see how the letters were supposed to look together. By doing this practice in Latin, using a book that has the English translation on the mirror page, I’m also picking up a bit of Latin as I go along, which makes redacting hands from primary sources easier as I am starting to recognize words and know what the letters are supposed to be from context. I hate my spacing, both the line spacing and the letter spacing. The changes in the size of the hand was somewhat intentional, however the execution was not as I had wanted it. For once though, I’m not going to beat myself up too much as I did this scroll while burning up with fever and shaking through chills and coughing fits.The fact that there is nothing horribly wrong with this scroll is a miracle. I should have realized my limitations and sent it out to have the calligraphy done by someone else, but I felt better in the morning and thought I’d be ok to do the work, but no, I just got sicker. Turned out it was full blown pneumonia. But I got it done, and it looks better than some of my work, so that is somewhat a win. I have a few funny pictures of the illumination – this is from when I was getting sick but not quite as sick as I was when I did the calligraphy – It was easier to do the painting lying down since the position kept my hand from shaking too much from the fever and it kept it easier to brace for when I’d go into coughing fits. Luckily I had already done most of the illumination in the weeks before, so there wasn’t too much to finish in that vein once I got sick. I did not go to the event to see it given out. I hope it was received well. I also hope that it doesn’t play Trojan horse, bringing this virus into other people’s houses. So my latest assignment (and I promise to update the blog with the last six month’s worth of assignments soon.. I promise) was a Silver Brooch for a 14th century Welsh persona. Based on the write up, she’s an avid embroiderer who helps out with elevation garments and enjoys researching primary sources to use for embroidery designs. As soon as I heard 14th century I immediately thought of the trap manuscript (Luttrell Psalter) and just as quickly said, NO WAY AM I DOING THAT TO MYSELF AGAIN, or at least so soon… And then remembered that there were a bunch of psalters from that time frame with equally awesome illuminations – particularly my favorite, the fox preaching to the geese. So I looked up fox and geese and psalter and google came back with the Gorleston Psalter, which is not actually the manuscript I was thinking of, but is equally cool. And best of all, since it’s not the Luttrell, it doesn’t have those god awful flat feet in the calligraphy! It’s more of a proto-gothic, leaning heavily towards the gothic style. Which, while way more angular than I like doing, at least seems like something I could some day get good at, as opposed to the Luttrell hand of doom. I emailed back and forth with Mistress Briony to get some more clues on what the recipient would enjoy and found out that she has a love of bunnies. Perfect! This time period is crawling with bunnies! I browsed through the Gorleston Psalter, noting all the interesting and fun themes I found along the way as I totally plan to use this source again – it’s like a saner version of the Luttrell! And eventually I honed in on one particular page, 70v, which has a monk working at a scribal desk for its initial capital. I decided I could pretty easily make that into a woman working at an embroidery frame, which would be appropriate for the time period and recipient, and started looking for other elements to put together to better personalize the scroll. and lots of fun bunnies all over the place! I had a slightly shorter lead time than I usually have, or at least it felt that way since it was in that post pennsic month where time has a hard time existing in linear form. And to make the situation more stressful, my main scribal support network were on a cruise. So I was on my own, and decided to do the part I hate most, the words, first. Given the space concerns, I needed to make the text pretty small, but still personal. I ended up with 97 words, which fit pretty nicely. I actually ended up squeezing more space out of it, thus I kinda wish I had added another sentence, but my draft versions just fit, so that was the reason I didn’t make it longer. I’ve had too many occurrences of just barely getting all the words onto the scroll. This time I was going to play it safe. The first thing I did was trace the main elements of the design onto tracing paper and then overlaid it with another piece on which I did a first draft of the calligraphy, more to see how it would fit and how many capitals I’d need to do and where I could put the sentence spacers. It ended up making more sense to only use one of the spacers as the signature lines would end up taking up the bottom space. I still don’t have the discipline to get my angles consistent and I’m still not great on keeping my letters within the proper lines. It’s like it’s a test where you have to fill in just the circle, no more, no less – and for some reason my hand always slips, no matter how hard I concentrate. But it’s getting better with daily practice. I have very little desire to ever do full gothic (I don’t like how it looks) but I do hope to get better at this looser style. Leanne and I brainstormed some hands that might fit my natural tendencies better like humanist, but I like the cartoony style of the 12th-14th century. Ignoring for the moment the shapes of my letters (too round, I know) the two other issues are word spacing and line spacing. The line spacing is the stupidest mistake – for who knows what reason I started on the wrong line – DESPITE LABELING THEM- and then got slightly confused on the fourth line down. There is nothing to be done here other than beat myself with a heavy book. But I swear I do this every time… It’s so frustrating. My word spacing issues come from my perennial fear of running out of space. I over compensated this time, smooshing everything in together. I think more vertical guidelines would have helped with this – but also doing more drafts at full size on the tracing paper so I can be more confident that my words will fit on the page. As for the illumination, I think it came out pretty well. It’s very hard to tell from this picture because of the lighting (zooming in helps), but there’s white work on everything and it really adds a great dimension to the piece. I like the natural graceful shape of all the shapes. I measured and drew most of it by hand, and then traced over that to get the more natural lines. I decided to keep the slightly listing border design (the words are justified, but the border isn’t, it’s at like a 10 degree angle to the words) as that was how many of the borders were presented in the original, and I could see why the scribes had chosen that option – the text was the more important part and this was the easy way to make the border fit in around the capitals. I used Holbein Gold gouache, mixed with WN Alizarin Red gouache to get a range of gold shades to make the gold on gold work look better and feel more three dimensional. The rest of the highlighting and shadows were done primarily using whitework, which sadly isn’t showing well in this photograph. This was one of the first scrolls I’ve done entirely with gouache instead of using my WN watercolor pans, I’m not sure if it made much of a difference. I do think that the gouache is better for the flat background colors, but I think I much prefer the pans for the shading layers and details as it’s easier to get a consistent layers of paint with the watercolors. Mixing up colors with all the different shades I might need is hard to keep track of and not contaminated with other colors – though that’s mostly because of 20 years experience with high quality watercolors. I’m too used to being able to just mix on the fly. Which style is more period really depends a great deal on which time period. The difference between gouache and watercolors is primarily the binders and amount the pigments are ground down. Looking at earlier period manuscripts (pre 1300’s) it seems like the technique is closer to the watercolor theory of layering lots of very light coats of pigments in a thin binder. But starting around 1300 you start getting images that look more three dimensional and involve layers of more opaque paint on top of one another. This is much more in line with the gouache techniques and I think also the tempera techniques, though I haven’t played with tempera in many many years. This change in techniques allows for the later full color borders with intricate bugs and flowers that appear lifelike. That is technically possible with the watercolor technique, but is significantly easier with the gouache style of painting. And then we have an AoA that I did all by myself. The calligraphy looks kinda awful, but it looks exactly like the source. Source :http://gallica.bnf.fr/ark:/12148/btv1b8423829s/f13.item.zoom It’s a weird transitional hand. Crafting/Art – Continue doing something creative every day. Learn a new thing each month. Update the blog regularly!! SCA – Teach more classes on different subjects. Get one period competency with Athena’s Thimble. Enter at least 2 A&S competitions. Do a high merit award scroll. Social – Step away from internet arguments instead of continuing them. Continue to invite people over the house once a month. Hangout with someone new at least quarterly. Consciously practice deliberate speaking and writing. Ask more questions about what other people are doing and listen to their answers. Don’t give unsolicited advice. Cooking – Have at least 1 fruit every day. Have at least 2 veggies every day. Eat at least one meal every day that could be claimed as home cooked (toast does not count). Fitness – Endurance: be able to run a mile without stopping in 10 minutes. Strength: get upper and lower body to 150 lb weight resistance. (Currently I’m at about 70) Go to gym 12+ times a month, ideally get 250 minutes of cardio a week. Health – Weight – I suppose a better goal would be shape based, apparently hip to waist ratios for women should be lower than .85, and ideally around .7 (I am currently .9) I would also like a bust measurement of less than 44 inches. Crafting/Art – Document all projects as I start them. Try to do something creative at least 250 minutes a week. Draw something every day. Also write every day, preferably in a journal. Post to my blog at least once a week with my updates. SCA – Have “respectable” feast gear. Have at least 1 outfit to wear in court that I am not ashamed of. Make a scribal portfolio. Enter at least 1 A&S competition. Teach 3 classes at various locations. Learn more metal working skills. Document what I make on my blog. Get to Craftsman status with Athena’s Thimble, try to become a senior member. Perhaps become an apprentice? This one I nailed. Though it did take me basically all year. I have respectable feast gear. I have 1 outfit, and soon a few more (they just need some handwork) that I feel comfortable wearing to court. 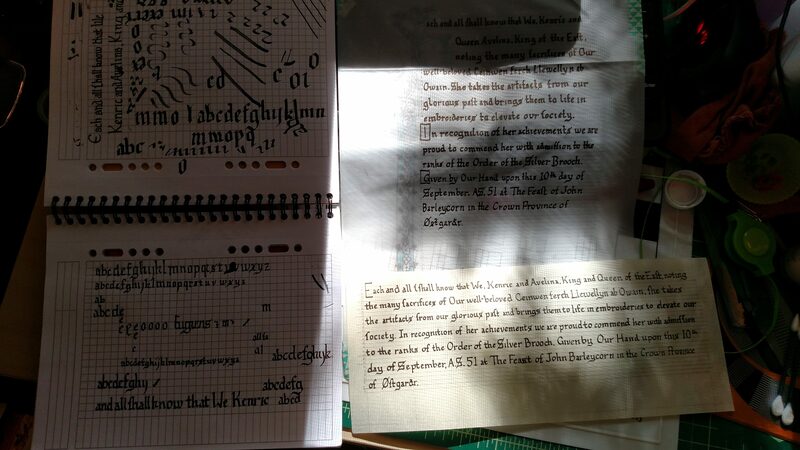 I not only made a scribal portfolio, I am a real scribe now, doing live scrolls, finally. I entered 1 A&S competition, which was pretty fun/miserable, I still am somewhat on the fence about K&Q in a month, but if I can manage to scrape together a portfolio of viking spoons.. I’ve taught at least three classes at various locations, some even weren’t intro to embroidery! I’m still working on remembering to blog about the projects though, but I’m working on it. I did finally attain Craftsman status with Athena’s Thimble at yule. I need a few more Ps&Qs before I get to try to be a senior member. AND, best of all, I did apprentice myself to Rozi. Hopefully next year I’ll have some time for more metal working. Cooking – Have fruit every day. Have veggies every day. Bring my lunch to work at least 4 days a week. Eat out no more than twice a week during normal situations. Ha ha.. nope. I think I might have even gotten worse about this this year than last. Though I have at least been eating at restaurants less, but I’ve mostly done that through intelligent snacking. Gardening/Farming – Harvest foods before they go to seed. Dry herbs for the winter. Can food for the winter. Keep the weeds down around the garden. Compost the chicken litter. Nope. I planted two planters, nearly everything died. There was nothing to can. I gave up on the garden because I was too busy in the spring. Building – Organize all the tools and put up a peg board system. Cleaning – Re-organize the pantry twice a year (once already done today), get my room to a manageable amount of stuff. Yay it’s time for the annual pantry cleaning! Which means, yeah, no, I didn’t do it twice a year, though I did a quick sort sometime in the summer. I have managed to go to the gym about twice since 2014. That said, I don’t think I’m in considerably worse shape, but I certainly did not meet these goals and will probably use them again. I am the same size and shape I was in 2014. Which while better than being worse, is still not reaching the goal. Goal will remain the same. Priority will be on me in 2016, not everyone else.